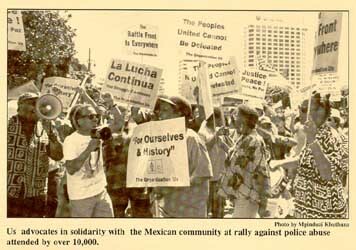 On behalf of my organization Us and African people, we come to stand in solidarity with the Mexican community in the struggle against the recent brutal police beating of the Mexican immigrants that reminds us so much of the Rodney King case, and we come to reaffirm the ongoing battle both our communities are waging to end such savagery and the societal injustice which gives rise to it and supports it. We come also to honor our social justice tradition which as Fannie Lou Hamer says demands that we struggle to bring right and justice where there is wrong and injustice. Moreover, it is a tradition which requires struggle for respect for the dignity and rights of the human person, economic justice, meaningful political participation, shared power, cultural integrity, mutual respect for all peoples, and uncompromising resistance to all social forces and structures which deny or limit these. And we come here to reaffirm our organization Us' position that we must not simply come together on tragic events like these, but must constantly engage in cooperative projects based on a new ethics of sharing. Sharing must become a central word and concept in our moral and political vocabulary and practice. We must embrace an ethics of sharing which includes commitment to shared space, shared wealth, shared power and shared responsibility to define and struggle to bring into being the just and good society we all want to live in. We must be willing to live together in harmony, to constantly search for common ground in the midst of our differences and diversity. And we must share wealth and power in this country and most of all struggle together to achieve this and to build the society and world we all want to live in. We know that the struggle is a long and difficult one and that "the battlefront is everywhere" and there is no quick and easy path to a future of freedom and justice. Pamoja tutashinda. Ikiwa tumeungana, hatutaweza kushindwa. Together we will win. United we cannot be defeated. Juntos venceremos. Unidos, no podemos ser vencidos. 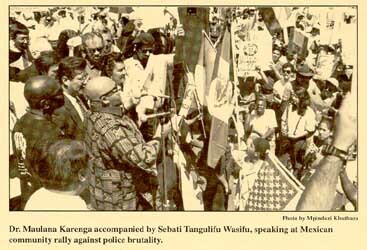 This statement was presented at a Mexican community rally against police abuse. April 6, downtown Los Angeles.